Reiki is a Japanese word representing the underlying force behind every living being. 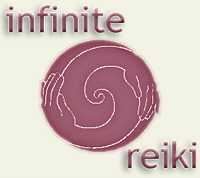 Reiki also refers to an ancient healing art rediscovered in the late 1800s by a Japanese scholar, Dr. Mikao Usui. It is a non-invasive, gentle yet powerful method of healing that works on all levels - physical, emotional, mental and spiritual. Reiki flows wherever it is needed most, releasing blocked energies, cleansing toxins and helping to return your whole being to a state of balance.